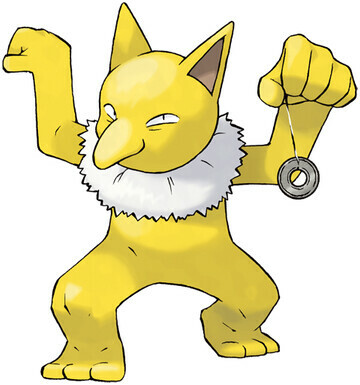 Hypno is a Psychic type Pokémon introduced in Generation 1. It is known as the Hypnosis Pokémon . The effectiveness of each type on Hypno. 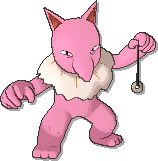 In Generation 3, Hypno does not have the Forewarn ability. In Generation 1, Hypno has a base Special stat of 115. In Generations 1-4, Hypno has a base experience yield of 165. The arcing movement and glitter of the pendulum in a HYPNO’s hand lull the foe into deep hypnosis. While searching for prey, it polishes the pendulum. In Alola, Komala is Hypno’s main target. It rarely harms people. There are some Hypno that assist doctors with patients who can’t sleep at night in hospitals. Hypno learns the following moves in Pokémon Let's Go Pikachu & Let's Go Eevee at the levels specified. Hypno learns the following moves in Pokémon Ultra Sun & Ultra Moon at the levels specified. Hypno learns the following moves via breeding in Pokémon Ultra Sun & Ultra Moon. Details and compatible parents can be found on the Hypno egg moves page. Hypno can only learn these moves in previous generations. It must be taught the moves in the appropriate game and then transferred to Pokémon Ultra Sun & Ultra Moon.